Inspiring Ideas with artist Jeanne Winters: Pleated Poppy at (in)courage Giveaway Winner! 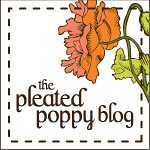 Pleated Poppy at (in)courage Giveaway Winner! ... "Lora" who blogs at My Blessed Life! Congratulations, Lora!! Have a look, then email me your choice and mailing address!! Hey all! Please pop back to my previous post about Helping Mommy When She's Down and add your ideas, too! Thanks! !